It felt like an age since the last game I'd been to. Last weekend had been spent cleaning out my Mother-in-Laws house after she had passed away in May so the Guisborough Town game had taken place in my absence. There had been the usual pre-match text from Pogo Patterson wondering where I was but it was out of concern more than questioning my loyalty. After all the team were playing some great football, especially away from home where seven wins on the trot had lifted them to seventh in the league. It was however, the home form that was proving a bit of a sticking point with one point gained out of six in 2018. The reasons were being thrown around like confetti: the fear of finishing in the top two and the enforced promotion that could bring about but the most believable one was the pitch! Despite being worked on in the summer, the Hillheads turf was not looking its best. The 5-2 win at Stockton had been played out on a 3G all-weather pitch: was it much more suited to the Bay's style? The pitch had had a bit of a trim and didn't look too bad but it sure wasn't a 3G or as flat as the Shields pitch. The rain, snow and wind that had battered it over the last month certainly hadn't done it any favours. 3G for Hillheads anyone? The Boy Mark and I were joined by Running Keith and he was especially excited to finally receive the blue and white bar scarf that I'd ordered for the pair of us. TBM was indifferent to our return to the golden age of football. Rosettes and rattles are planned next, along with 20 Woodbines and a Whippet each. (He's already got the flat cap). Unfortunately my baseball cap will have to go but then what do I think I am? American? On the pitch, things were looking good, with Brooksy on the end of everything going forward. With barely 10 minutes gone, the big man had put us ahead! The strong wind that was blowing towards the Allotment End was a mixed blessing with gusts occuring at inopportune times and despite playing into the tornado, Dunston were taking hold of play as the break approached. The Bay were struggling to stay ahead. In typical fashion, with three minutes to half time, the score was level: Mark Fitzpatrick heading home. Thanks to a terrible dose of Doom-Cold (that only men get and is very very bad), I resorted to some orange locozade from the teahut and in the second half it looked as if Whitley could have done with some themselves. For the second half, Dunston battered away. There was very little for my video to record in terms of Bay attacks and it was no surprise when the Bay conceded. This time, it was Dan Halliday who scored. 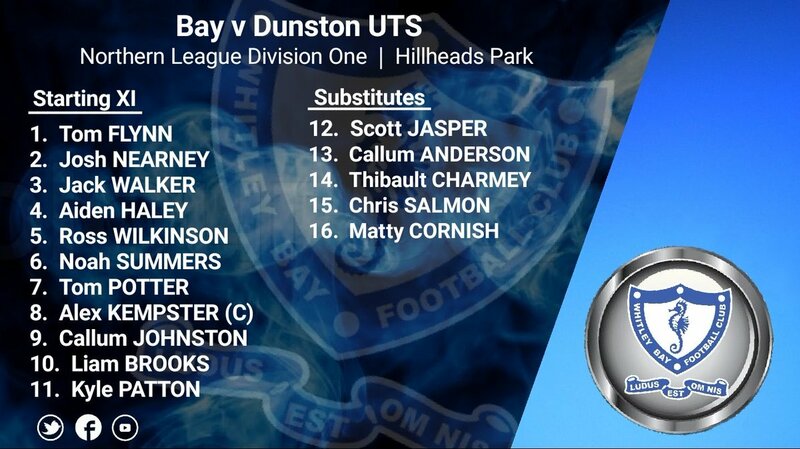 Two minutes later, in the 63rd minute, Liam Thear put Dunston 3-1 and that, as they say, was it. there hadn't been much to enjoy for the home faithful. Hopefully, the lads will bounce back on Tuesday and then we can say we were concentrating on the cup! See you Tuesday!